The year is 1905. Thomas Richardson (Dan Stevens) travels to a remote island to rescue his sister. She has been kidnapped by a mysterious religious cult who are now demanding a ransom for her safe return. It soon becomes clear that the cult will regret the day it baited Richardson, as he digs deeper and deeper into the secrets and lies upon which the commune is built. The opening shot of Apostle took my breath away. A steam train moves across a serene landscape and over a body of still, reflective water. It is stunning - the very definition of cinematic. However, I was not watching Apostle at the cinema. I was at home viewing Gareth Evans’s film on Netflix. I couldn’t help but wish I was seeing a theatrical release of Apostle (it was shown in a limited number of cinemas). Still, thanks to the impressive talents of both Evans and cinematographer, Matt Flannery, Apostle will, undoubtedly, look good on any screen. The beauty of these opening shots belies the darkness of Apostle. This is a dark and twisted story - a tense and foreboding, grim and grisly folk horror that keeps you guessing from the first until the very last scene. Evans is a master at creating uncomfortable, palpable tension and the first hour of Apostle is full of mystery and suspense. While not much actually happens (and the first half of the film is, perhaps, overlong), at no point did I ever feel safe. Every time I thought I knew where Apostle was taking me, it would veer off in another - often shocking - direction. This might well prove frustrating for some audiences (like fellow Netflix Original, Hold The Dark, it’s going to prove divisive) but I thoroughly enjoyed the world that Evans has created. I was also entertained by the performances from (a brooding) Dan Stevens, Lucy Boynton, Mark Lewis Jones and Michael Sheen (who has great fun with his role of prophet). However, it wasn’t until the film’s final act that I truly engaged with Apostle. As events come to a head, Evans ups the ante with some consistently surprising developments and scenes of gruesome, bloody violence. While much is left to the imagination, Evans is unafraid to show us some wincingly brutal images. 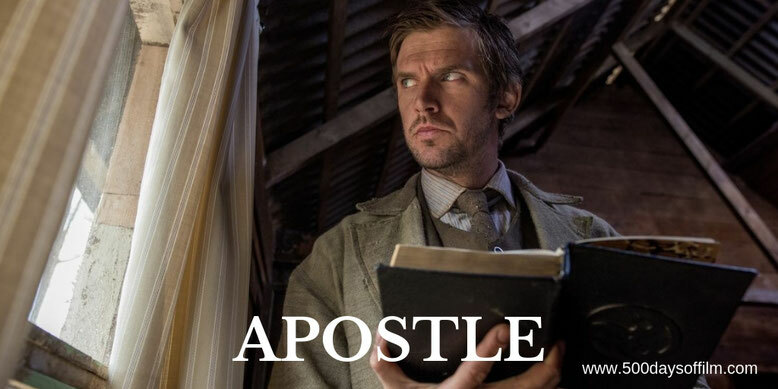 From there, Apostle becomes an exhilarating horror ride and, while the film got away from Evans on occasion, I loved every minute. His creative vision and commitment is just so impressive. So, while I wish that I could have seen Apostle on a big screen, I am so thankful to Netflix for allowing this exceptionally talented director the space to tell his dark and twisty tale. While I enjoyed Apostle, my favourite Gareth Evans film is The Raid - my all time favourite action movie. If you have, what did you think of this movie? Let me know in the comments section below. Alternatively, get in touch via Twitter. You can find me @500DaysOfFilm.